Product #156 | SKU 8-003-0023 | 4.0 (based on 1 rating) Thanks for your rating! The Redrock Micro microShoulderMount Deluxe Bundle turns nearly any camera into a portable, shoulder-mounted production rig. Whether you're shooting with a tiny consumer camcorder, a video DSLR, or an ENG-style camera and 35 mm lens adapter, this kit not only increases the stability of handheld shooting, it provides new levels of flexibility to how you shoot. The shoulder pad and two rubberised handgrips can be adjusted in nearly any configuration along the included handlebar rods and 18"(45.7 cm) carbon fibre support rods. And with the addition of a Redrock microMount ( not included ), the rods can be used to support a host of accessories, from articulating arms to external monitors, batteries and portable hard drives. Generally this system requires at least one additional component: a rod clamp or a microMount with spud for external monitoring. The microShoulderMount can be adapted to just about any style of shooting or camera. 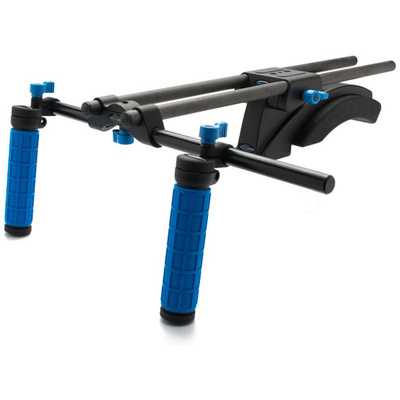 The handgrips and shoulder pad can be integrated onto your existing 15 mm rod system for a compact setup. For maximum flexibility, the microShoulderMount can be run on a separate set of rods ( not included ) beneath your rig for quick attachment or removal of the shoulder mount support. For ENG style cameras with an integrated shoulder pad, the handlebar, grips, and rod clamp can be attached directly to the camera while using the camera's own shoulder pad. And for setups requiring precise balancing, use a separate rod clamp ( not included ) from the one that's connected to the shoulder pad, so the camera and shoulder pad can be moved independently on the rods. You can enhance the microShoulderMount with other Redrock accessories. You can personalise your rig to exactly meet your needs today, or grow your rig as your needs and camera configurations change. Optional microMount connector with 1/4"-20 male/female tap can be used to mount on-camera LCD monitor, articulating arm, or other accessories. The microMount can also be positioned on any 15 mm rod anywhere on your rig for added flexibility. I have this rig and the universal cage. It's light and can be configured for just about any shooting style. Even the big rig with mattebox attached is still light and comfortable enough to shoot for long periods.